When it comes to the world of inflatable design we know there’s no room for error. Design with creative flexibility and confidence that you can produce what every you can dream up at a price your client can afford. While the teardrop has been an iconic shape in the hot air balloon and inflatable industry for years, it simply doesn’t have the capacity to tell a story the way a compelling and creative inflatable design can. So don’t compromise. Using ExactFlat software you can design it any way you want without worrying about production problems! Develop your 3D inflatable design and import it into our one-one-of-kind software. With our technology, you can quickly flatten your design into a production-ready pattern. Then Create drawings, Cut and Construct. It’s that easy! With just five minutes on average ExactFlat software can convert your 3D design into a 2d flattened pattern that is ready for production. 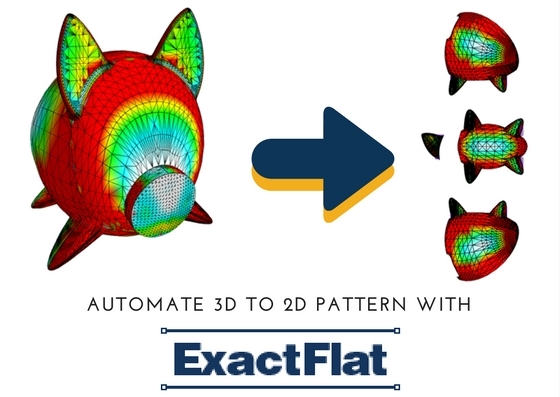 Not only is the pattern ready quickly, but save more on time as ExactFlat software’s unparalleled accuracy eliminates much of the trial and error process. The reduction in pattern making and fit testing makes our software a fast and profitable win for your business. Get creative with uncompromised design on the most unique projects. Quickly cut and construct your inflatable product using purpose-built tools for seam and notch definition. Cut costs with significant reductions in all phases of the production process—flattening, pattern engineering, materials usage, and more. Start designing your next product today with ExactFlat’s free online trial experience or request a one-on-one demonstration customized for your business.